Sambaa K’e is a small, isolated traditional Dehcho Dene community of approximately 100 people located in the southwest corner of the Northwest Territories. Apart from the short winter road season, the community can only be reached by plane charter, primarily out of the regional centre of Fort Simpson. As Chief Dolphus Jumbo told me, “Sambaa K’e exists between two worlds. We walk Down the trail that has the old ways on one side and all the benefits of our modern society on the other side. Our challenge, every day, is to stay balanced.” To support this vision, I was invited to the community to help develop projects facilitating knowledge exchange between Elders and youth. The first project was Sambaa K’e Print Studio. The studio now acts as a creative tool for the community to visually explore aspects of their culture and relationship to the land. In addition, the artwork produced has contributed to a growing regional and international dialogue between Sambaa K’e and other communities. Sambaa K’e invested in capital equipment and space, and I obtained multi-year funding from the territorial Department of Industry, Tourism and Investment for training and supplies by demonstrating how such projects can enhance community capacity development and sustainable economies in remote communities. The studio is now used by a very high percentage of community members and hosts visiting international artists and graduate students (whose residency requires their participation in training and community workshops). Local people have been trained to manage the studio, run community/regional workshops, and facilitate individual artists and designers. In order to support a local creative economy, we are developing a market for printmaking supplies made by community members using existing traditional skills. Work from the studio has been exhibited nationally and internationally and a publication was produced to celebrate the first year. Ongoing links with multiple Northwest Territories cultural organizations, the University of Alberta, the University of Dundee, and Dundee Contemporary Arts facilitate additional exchanges and training. Printmaking has now become a valuable tool for documenting and communicating Sambaa Ke’s relationship to its homeland while also facilitating communal envisioning workshops aimed at realizing the final design for a major cultural facility. The design, scheduled for completion in late 2016, is seen as a precedent-setting project across Canada’s western Arctic. Folio of self-built structures for referencing detail. Designing for a sustainable community infrastructure and housing based on the synergy between Tlicho Dene traditional knowledge and contemporary design practice. Gameti Ko, originating in my peer-reviewed UK Arts and Humanities Research Councilfunded research on the Tlicho Dene’s idea of home, aimed to further cultural continuity and locally controlled sustainable development through a series of participatory design workshops and charrettes. Its primary purpose was to suggest ideas for modern dwelling based on Tlicho traditional knowledge for the community of Gameti. Details of the projects origin can be found in: Gavin Renwick, “House, Homeland & Self Determination: The Gameti Ko Project, NWT,” in On Site: Architecture and Design (Architecture in the Circumpolar Regions) 11 (Spring 2004), 11-13; Gavin Renwick, The Land We Live On Is Our Home: The Gameti Ko Project, Report commissioned by Canada Mortgage & Housing Corporation, 2005; Gavin Renwick, “The Cultural Imperative of Self-Determination,” VIEW: Policy Insights from Scottish Civil Society (Connecting to the Global: Scottish Civil Society’s Place in the World) 5 (spring 2006), 20-21. Prince of Wales Northern Heritage Centre, Yellowknife, NWT, 2006. 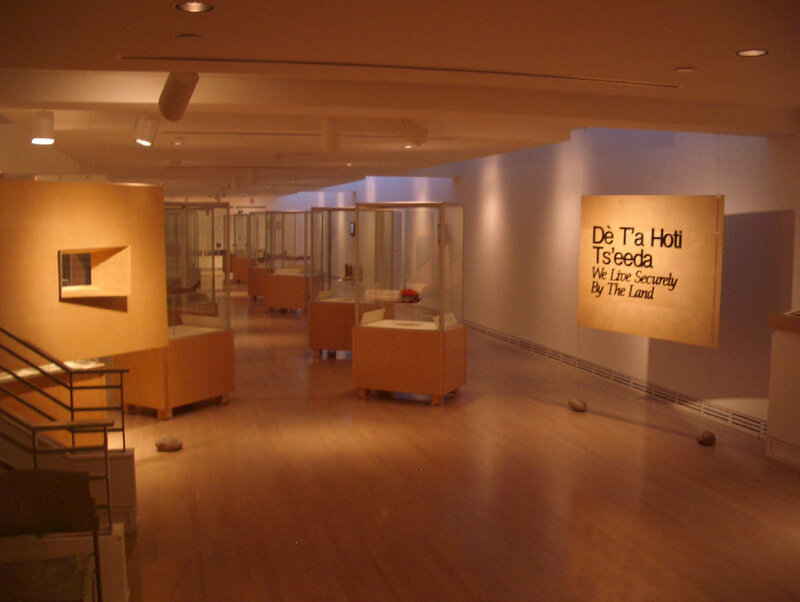 Carleton University Art Gallery, Ottawa, 2007. National Museums of Scotland, Edinburgh Festival exhibition, Edinburgh, 2008. De T’a Hoti Ts’eeda was an exhibition and catalogue I co-curated in collaboration with Dr. Tom Andrews, Territorial Archeologist for the Government of the Northwest Territories. The Athapaskan collection of the National Museums of Scotland consists of objects collected between 1858 and 1862, a time when Western influences were first starting to cause changes to Dene society. As there had been no contact between the Dene and the National Museums of Scotland since the collection was assembled, this project ended a 150-year hiatus and created opportunities for new conversations to develop. Dé T’a Hoti Ts’eeda provided many occasions for listening to and documenting elder’s stories about the objects, stories which often differ from the textual information usually found in ethnographic displays. This relationship between living story and historical artifact was also the substance behind the associated educational program that brought Elders and youth together to promote cultural continuity. The exhibition demonstrated that a major role for the 21st century museum is to facilitate dialogue through working in parity with Aboriginal communities. The project also facilitated multiple visits and cultural exchanges for Tlicho community members to the National Museum of Scotland. Royal Albert Memorial Museum and Spacex Gallery, Exeter, England, 2001. Centrespace Gallery & Cooper Gallery, University of Dundee in March 2008. Home: The Outpost of Progress was a multi-faceted exhibition held simultaneously at the Royal Albert Memorial Museum (RAMM) and the Spacex Gallery in Exeter. The exhibition originated in my being awarded the position of Millennium Artist for SW England. Working with the Ethnography Department, I promoted a post-colonial rethinking of the RAMM collection by selecting a series of objects from storage that embodied a northern, non-Western idea of home and installing these objects throughout the museum in order to compare them to our underlying Western assumptions about home. This intervention was accompanied by an installation in the World Cultures Galleries, also at the RAMM, and an exhibition at Spacex Gallery presenting my development of a methodology for cross-cultural visual thinking. My work on Home came at the conclusion of a UK ‘Year of the Artist’ residency at the museum, and the catalogue was a co-publication of the two institutions. This exhibition was followed by the The Home Office, a two-venue solo exhibition within the Centrespace and Cooper Galleries, University of Dundee in March 2008. 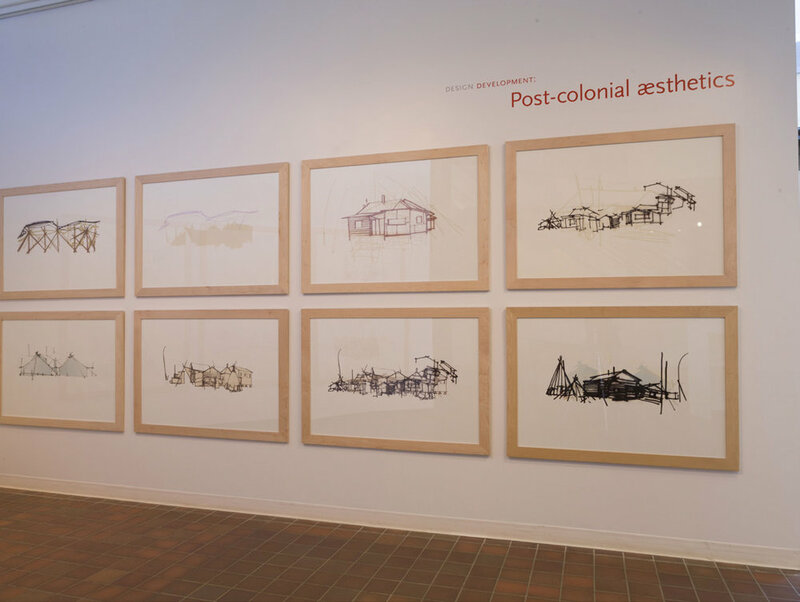 This subsequent exhibition built on my work in Canada’s Northwest Territories. It furthered the content of the first exhibition by exploring how my Canadian research provided an analogous resource to explore similar issues of self-determination in a post-devolution Scotland. The exhibition was also a catalyst for an extensive interdisciplinary program of public discussions. Istanbul, Athens, Belgrade, Budapest, Prague, Berlin, and Glasgow, 1989-90. Whaur Extremes Meet began as a research exploration into the social and spatial relationships of traditional nomadic Turkish society and evolved into a multi-national project timed to the fall of the Berlin Wall and associated revolutions across Eastern Europe. Designed in collaboration with artist/anthropologist Wendy Gunn (now based at the Mads Clausen Institute, University of Southern Denmark) and supported by environmental engineering input from Ove Arup & Partners, Whaur Extremes Meet was a modular, zero-impact structure constructed in prominent public spaces in seven key cities. The structure provided a focus for both programmed and spontaneous discussions, events, and workshops, all organized by the inhabitants of that city. Topics ranged from the effects of rural migration on Istanbul to the effects of totalitarianism on Prague’s urban space, and from the virtues of internationalism over nationalism in Belgrade to how to develop Potzdammer Platz in Berlin. Funding for the project came from a variety of sources, demonstrating both the project’s international relevance and its ability to cross between artistic, government, industrial, and corporate communities: the British Council, the Turkish Government, the Scottish Arts Council, the European Cultural Foundation, Ove Arup & Partners, British Rail International, and the Turkish bank Emlak Bankasi, Istanbul were all funders of the project. One of many introductory articles about the project is “Whaur Extremes Meet: The Story of a Line,” published in Transportable Environments, Ed. Robert Kronenburg. London: E & FN Spon.